We the indigenous people of Biafra (IPOB) and it's leadership worldwide note with grave sadness the role Swiss embassy in Abuja have elected to play in aiding and abating the unlawful disappearance of people in Nigeria by denying entry visa to Switzerland to members of Kanu family and other first hand witness to the Nigerian army massacre of unarmed civilians at Nnamdi Kanu's compound in Isiama Afaraukwu on 14 September 2017. This is a clear case of criminal conspiracy between a member of staff of the Swiss embassy in Abuja and the Nigerian Government to deny United Nations investigators access to vital information and facts surrounding the murderous invasion of Nnamdi Kanu's compound by the Nigerian military. Instead of commending the UN for their intervention, the Swiss embassy instead chose to act out of character by appearing to support impunity and gross violations of the rights of the Kanu family to seek justice. 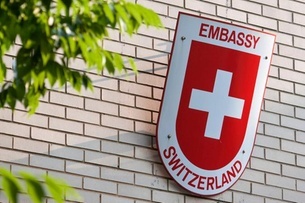 The conduct of the Swiss embassy is unbecoming of a civilised country, who by this action, appear to be collaborating with the murderous Buhari regime in their persecution of Biafrans. It should be pointed out to the Swiss embassy in Abuja that Prince Emmanuel Kanu, the younger brother of our leader visited the United States of America recently on a two years multiple entry visa and returned to Nigeria. With all due respect, it is given that most people seeking to overstay their visa would rather prefer to do so in the US than Switzerland. Therefore the reasons given by the Kogi born employee at the Swiss embassy for refusing visa to the Kanu family is laughable. We must also remind the Swiss embassy that IPOB women also in the past months attended a conference in Baltimore, Maryland USA and duly returned to their respective countries of abode after the event. We are at a loss to understand why Swiss embassy chose this line of action when the lives of human beings are at stake. Is the Swiss government through their embassy in Abuja giving tacit support to abuse of human rights in Nigeria? Is Switzerland seeking to influence or impede the work of the United Nations? The United Nations office invited the Kanu family to meet them in Switzerland to ascertain what truly transpired during the massacre of the 14th of September 2017 at Isiama Afaraukwu during Operation Python Dance 2. This ugly episode necessitated the enforced disappearance of our leader Mazi Nnamdi Kanu, his aged parents and other family members of IPOB since last year. It is important we state clearly that our leader's whereabouts is still unknown since that very invasion. If the United Nations have chosen to invite surviving members of the family to a meeting in Geneva to ascertain the facts, why is the Swiss embassy stopping it? A copy of the UN letter inviting Prince Emmanuel Kanu and the rest of the family to the event in Geneva is in the possession of the Swiss embassy, so why the reluctance to issue the entry visa if not for political considerations. Should the Swiss government allow this travesty to subsist, IPOB will have no option than to regard it as an accessory to mass murder and promoter of human rights abuses in Africa. Switzerland survives and thrives as a nation from the loot of African rulers, dictators, selfish, myopic greedy politicians. Without the loots coming from Africa - especially Nigeria, Switzerland will be a very poor country. Shame on them for refusing visa to Mazi Nnamdi Kanu family members and IPOB invitees by the United Nations. The Swiss Ambassador should be recalled immediately and off-course, Biafra will never have anything to do them diplomatically unless they retract and apologize. Shame on the Swiss.